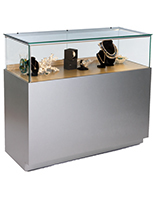 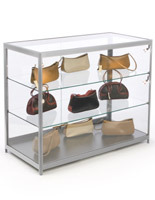 Our collection of silver retail showcases will add considerable style to your store's interior decor. 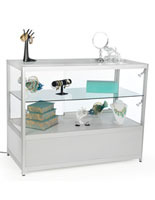 The soft and subtle finish lends a more relaxed and sophisticated vibe when compared to stronger colors. 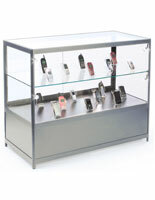 All models in this collection (with the exception of the register stands) feature tempered glass construction. 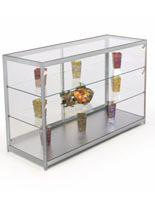 In the event of breakage, traditional plate glass shatters into large and very sharp shards. 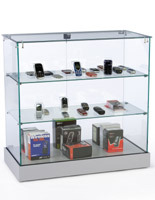 Our tempered glass panels and shelves break into smaller pieces, increasing the safety factor immensely. 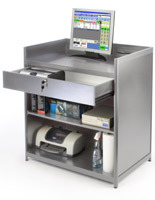 So, what types of retail counters are available? 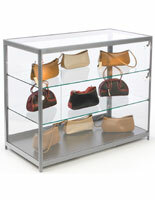 You can break down the models into two groups: framed or frameless. 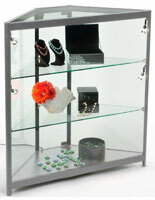 The framed styles, depicted as having extruded aluminum channels running along each side of glass, are on the lower end of the pricing spectrum. 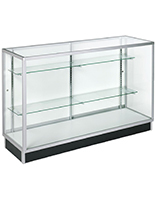 Comprising some of our most popular models, these offer full vision display of your valuable merchandise on two or three interior shelves. 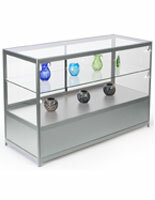 One of the main points to consider when choosing between the framed or frameless styles is adjustable shelving. 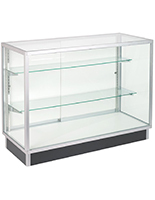 The shelves on the frameless models are fixed, so if you desire better display flexibility we suggest sticking with the framed cases. 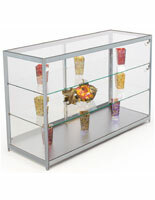 The frameless cabinets offer a more upscale presentation but with added cost. 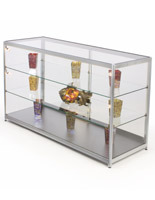 Both choices feature some models with internal lighting which really adds to the wow factor, especially when highlighting expensive items. 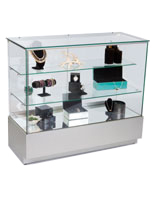 When it comes to high-ticket merchandise, security is always an issue so all cabinets are lockable. 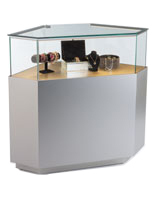 Deciding to purchase silver retail counters? 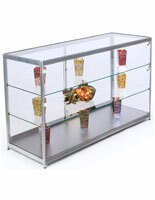 We stock each model as a single unit as well as in pre-designed configurations, all with same day shipment. 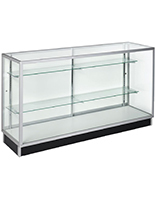 The multiple-unit configurations display their overall dimensions on each product page, so if you are considering one of them be sure to verify that layout will fit inside your store.